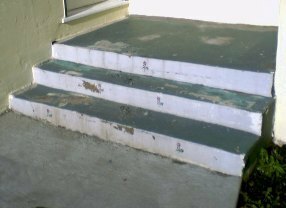 The steps and porch are made of concrete the old paint is peeling. The porch is about 5′ x 6′ in size. How many coats of paint will be needed? Cost to sand, stain and varnish threshold. Cost to sand and paint metal lamp post.